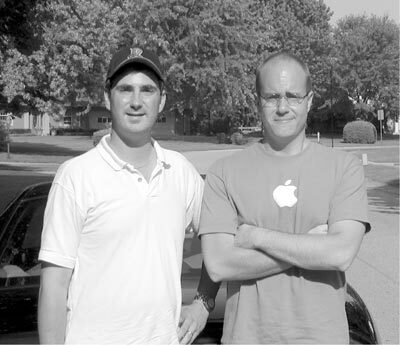 The author with Aaron Adams (right) near Dayton, OH, July 2003. CC [Craig Contardi]: How did your co-workers react to your newfound fame? AA [Aaron Adams]: I never said much to my co-workers about it because I don’t have that giant an ego. It was an ad in Sports Illustrated that let the cat out of the bag. A co-worker spotted an issue with my ad, and the gentle ribbing began. Actually it really started even before then, when I brought my first iBook into the office. Everybody teased me about it, but they couldn’t resist wanting to see it. I describe it as akin to the “adult” section in a video store. Lots of people act clearly like they want one, but are afraid to take the leap for fear they’ll be “caught”. AA: Todd [Aaron’s friend, who accompanied him to this interview – ed.] saw my PowerBook and decided he needed a Mac of his own. I paid $3000.00 for mine and there’s no doubt the price takes your breath away. That’s what I tell people; At the register it’ll hurt, but you’ll see what your money bought when you get it home and start using it. CC: If someone is not interested in any of the various aspect of Apple’s “Digital Hub”, should they still get a Mac just for the stability of Mac OS X? AA: Simplicity, as much as stability, is the main strength and main reason for going Mac. You can setup a Web server in three clicks under Mac OS X; I think even my mom could do that. On Windows XP it’s a little more involved, therefore a little more overwhelming. Installing and deleting applications is painless with a Mac; Drag and drop is all it takes most of the time. You need to use that Add/Remove Programs wizard for Windows, and oftentimes it asks the user if it’s OK to delete a particular DLL because “it may be used by other applications”. Every time I have to deal with that I think to myself, why is it asking me if it’s OK to delete this DLL? That is not fair to ask a novice user, and it’s clearly avoidable based on Apple’s approach. Here’s another great story I like to tell. I have a Zip650 USB external CD. When I plugged it into a Windows machine, it went through device driver loading and after 14 steps I finally could use the device. Under Mac OS X, I plugged it in and nothing happened. At first I think this is a sign of failure, but it turns out that it was recognized right off the bat with no additional drivers. It was just waiting for me to insert a disk, and then it worked like a charm. The story is basically the same for media card readers, and any devices I put in the PC Card slots in my Titanium PowerBook. Every digital camera I have tried to use with iPhoto comes up automatically, and I’ve tried a bunch. One day when I’m on my deathbed, I’m going to regret the time I wasted, over the course of my life, looking for Windows drivers on the Internet. I only use and know Windows because it’s really hard to make a living as a Mac systems administrator, especially in Dayton. Most governments and companies have bought the lie that they need to mandate Microsoft SQL Server and other Microsoft products in a contract proposal, even though Linux/MySQL/PHP would work as well for a lot less money. Before I rip Microsoft too much, they do some things better than Apple. They generously seed all their certified professionals with beta versions of all their software. All they ask in return is some feedback. In contrast, Apple is not likely to let Todd and I have a preview copy of Panther because the bar for that is set at being a paid member of the Apple Developers Network; we are members of the Apple Consultants Network. Our job is to evaluate products and recommend the best solution to our customers. We really need to evaluate Panther for ourselves before we can recommend it, but most likely we will have to wait until the public release date. Apple also needs to do a better job pre-announcing what’s in the “goody bag” that consultants get every quarter. Had we known Keynote would be in a pending consultant package, we would not have gone out and bought it ourselves at retail price. CC: How did you get hooked up with Shawn King [host of Your Mac Life]? AA: He actually got a hold of me. Shawn sought out a bunch of Switchers and Apple seems to like to refer me to journalists; I guess they think I can speak intelligently. Shawn called me and asked if I’d mind being on the show. I had only heard it once before, and that was a while back. He interviewed myself and others on the July 3, 2002 show; Since then I think I’ve been mentioned each and every week, sometimes for no good reason. Someone else was doing the YML Forums page and Shawn asked me to pitch in. I redid it to base it on PHP BB. I still don’t know a lot about PHP, but I do know more than Shawn does! I’ll be at Macworld CreativePro in New York this year  because Shawn asked me, and I’m excited about it. I hope I can make it to the advanced server seminar. I’ve also got tickets to see David Letterman; it’ll be my third time there. CC: My father-in-law is running Windows 98 and he’s deathly afraid of re-installing the operating system. He just lives with system crashes two or three times a week. AA: A lot of the world is in that mode; they see crashes as part of computing. I could not disagree more. CC: What’s the biggest weakness of using a Mac? AA: The one weakness in Mac OS X is speed. They’ve done a great job improving it from 10.0.4, but at the same time it has a way to go in raw speed. CC: Do you use any of the iLife suite (iPhoto, iMovie, iTunes, iDVD)? AA: I don’t use iMovie a lot, as I do not have a video camera. However over this past Christmas I used a still digital camera to take a time-lapse of assembling a 3000-piece Star Wars Lego project. I’m still working on making an iMovie out of those stills. That was 7 months ago and I’ve still not finished it! I have iDVD 3 but I don’t think I’ve burned a single DVD; I just don’t videotape much since I don’t own a camera. Regarding iTunes, I’m a really big fan and customer of the iTunes Music Store. CC: What’s your opinion about the artists that have resisted letting their music be included on iTMS? AA: I’m tired of all the arguments against selling singles. I’ve said this on the record before but it bears repeating: My parents had several huge stacks of 45 RPM singles in their basement. Elvis, The Who, The Beach Boys and lots of other artists all did very well financially releasing tons of singles. They were also more widely heard as a result of the radio airplay. Why do some modern bands think they’re any different or better? People may not want a whole album; they may just want a track or two for their portable music player. Bands have the choice of making something on a song or two or making nothing by only selling by the entire album. It’s their choice, and they’re stupid if they choose the latter. I own multiple copies of Pink Floyd’s Dark Side of the Moon because I like the entire album. CC: How much music have you bought off the iTunes Music Store? AA: I’ve bought around $50 of iTMS songs, most of which were songs I had downloaded off the Internet beforehand. I think $1 a song is reasonable. For my iTunes library, the song source breakdown is 80% CD rips, 20% downloaded. Some of the original downloads were really artifacted and AAC [Advanced Audio Coding, Apple’s chosen format for music sold on the iTunes Music Store – ed.] is better quality, certainly “good enough” for casual listening. I also do like the legal clarity of buying them, and want to see the iTMS succeed. I think it’s a viable way to sell music once bands see the results for themselves. CC: Do you have any brothers or sisters? AA: I have a brother, but I don’t think he’s ever used a computer in his life to be perfectly honest. CC: I have a brother who enjoys giving me grief about being a Mac person. AA: Oh, I have plenty of friends that are like that. I said it in my commercial and it’s still true: I have not found anything I can’t do on a Mac that I could do on a Windows machine. I could care less about games; if someone does, they are better off with a dedicated console like an Xbox or Nintendo. The last game I played was Windows Solitaire. CC: Which model iPod do you have? AA: My iPod is 15GB; I had a 10GB that I sold to a Windows friend and you can’t wrestle it out of his hands. Ironically, he still rants against Apple. It’s that attention to detail, all the little things Apple does makes them stand out from everyone else. Our company just got in a shipment of brand new Dell laptops, and they are no smaller than the Gateway laptops we still have from eight years ago! What an utter lack of progress that reveals. Look how much smaller the Titanium PowerBook is than the PowerBook 520 series, a comparable time shift as there is between the new Dell and used Gateway laptops. PowerBooks also have a much more solid, professional feel, not “plastic-ish”. In the back of my mind it’s almost like the Dells are meant to be disposable. AA: I’ve actually got two. After last year’s keynote, Steve Jobs came to the front of the stage to mingle. I was right there and said to myself, “He just used my face in his presentation, he can afford two minutes to talk to me.” He was very nice to me, told me I looked good in the commercial, and asked what it was like to be famous. We chitchatted for a short while and then he was mobbed. Todd Wilder (Apple Retail PR Exec) invited me to the SoHo Apple store opening party later that day. I went in and had a few flutes of beer, met Avie Tevanian, and was trying to find Phil Schiller [VP for Marketing – ed.] I spontaneously decided to approach Steve again. He was in the midst of a crowd, with his back to me, so I walked up and touched him on the shoulder. There was a collective gasp from everyone in the reality distortion field, and they all froze. Steve turned around and I thanked him again for putting me in the commercial; he said you’re welcome and was not at all taken aback. When all is said and done though, what does someone like me have in common with a man who affects the lives of thousands of people every day, has countless millions in the bank, and is hardly ever without his handlers? It makes it hard to maintain small talk. But I had the compulsion to ‘meet’ him and was fortunate enough to seize the moment not once but twice. Avie Tevanian [VP for Software – ed.] recognized me, and I commented how impressive it is that Apple can do what all the flavors of Linux cannot; put a happy face on Unix and make it easier to use. I think Linux users are trapped in a technical bubble with no way out. I tried Linux before becoming a Mac user, but when I wanted to do system tuning and other really technical stuff, I was treated like a child on the Usenet newsgroups by the Linux cognoscenti. That’s why I get really steamed by people that try to push Linux as a Windows alternative when the Linux experts are not willing to coddle the newbies from time to time. CC: Tell us a little more about your machine ownership history. AA: I bought a 500mhz iBook running Mac OS X 10.02 and was frankly very happy with it. Mac OS X was slow but showed lots of potential (where it was going, what it was going to do). I kept it for a little more than a year, bought a 17” iMac to replace it, and realized I missed not having a laptop. I sold the iMac on eBay and bought the 1Ghz PowerBook. I don’t miss the 2” of screen real estate going from a 17-inch screen to a 15-inch, it’s worth being able to fold it up and go. What I’m really waiting on is the G5 in a laptop. That reminds me of something else. Benchmarking is a stupid idea to convince people your computer is faster. Apple has a lot more competitors than it has allies. It’s like painting a bulls-eye on yourself; you’ll be attacked from all sides about how the tests were fixed, and it’ll only be a matter of months before technology advances for Intel chips to the point where they surpass the G5. It has raised the attention the G5 has received, but it really only ticks off/alienates the more technical users with a conspiracy theory about unfair testing. It turns out Intel’s Hyperthreading Technology was turned off for the Intel-based machine, but Veritest [the independent testing company – ed.] said that having hyperthreading on resulted in slower benchmarks. The compiler Apple and Veritest used was gcc, which is not necessarily the best one available for Intel processors. In fact the gcc compiler on one chip might be more optimized than the other. There are just too many variables affecting the end result. CC: While these machines were announced in June, the top of the line dual-processor model is two months away from being available. That has got to kill the G4 sales. AA: No kidding. I also noticed that the least expensive G5 costs more than the entry-level G4. People do look at those numbers when it’s time to buy. CC: What do you think are the most effective ‘Switcher’ ads, including of course your own ones? AA: I’m possibly the most self-deprecating person I know, but nonetheless I think I’m exactly what Apple was looking for as a spokesman. Patrick Gant’s “Blue Screen of Death” angle was nearly perfect from Apple’s point of view. Also Dave Haxton’s ad, which I mentioned earlier was not used a whole lot. All these folks are technical people who have used both Windows and the Mac, and can make an intelligent decision. Janie Porche’s story about digital camera woes under Windows was right on the mark. On the other hand, I felt there were quite a few, especially in the second group that came after my contemporaries, that were there for “color”. They looked good on TV and told an entertaining story but not much else. Gianni Jacklone was definitely there to attract a certain demographic. Richard Ziskin, the umbrella guy, had that great line about hoping it rained every day. I won’t name any that I felt were flawed; Okay, I think I can get away with making this observation about Ellen Feiss’s ad, when she says, “The PC ate my paper… it was a bummer”. Where’s the proof of her actually using a Mac now? It’s nowhere in the ad that I could tell. I think the “second-rounders”, in other words those who were part of the second series of commercials both filmed and aired, knew the buzz generated by the campaign, knew what to expect and most importantly knew what Apple expected. Apple’s goal beforehand, or so I was told, was to just shoot a lot of film and see what ended up coming out the other end. The second-rounders learned from the experiences of the first. Jeremiah Cohick did his happy face, did his bit for the camera, and was great. The first round got three months of exposure, but the second round has been on the website ever since. Nobody has clued me in to what’s next from Apple. CC: What can you say about the financial arrangements? AA: Apple asked me not to talk about how much I was paid. I can say it was on a per-use basis, with differing royalties depending on the media (print, TV, website). CC: Does that mean you’re a member of the Screen Actors’ Guild? AA: [laughs] I did not think I had become a member of SAG since I never signed up or got a membership card, but they sent me a letter from them with pension and health care benefits! It would look good on my resume though. CC: Did the Switcher ad campaign win any awards? AA: I’m not sure, beyond Advertising Week picking me as Ad of the Month for June 2002 [feigns enthusiasm]. I was pretty excited about that, but never got an invitation to any ceremony. Life is pretty much the same as it was before I did the ad. Here’s a question you didn’t ask me: Would I do it all over again exactly the same way, or would I change anything? The truth is, I don’t know. A couple of times I laid awake at night and reflected on the fact that my giant head took up an entire page in Time magazine, that I was on during Friends, the NBA and NHL playoffs and Drew Carey. I’ve been seen by millions of people. Could I have done more with that or not? There’s always that little doubt in the back of your mind whether I made the most of it. CC: Do you think your 15 minutes are up? AA: Everybody uses that cliché. Did my 15 minutes really start yet? You see commercials of people selling cars and stuff, and if you saw that person in the mall the next day would you remember him? Has he really made an impression on you? CC: But do we know his name? AA: You’re right, they know my name. CC: Using your name is asking for credibility from the viewer. AA: I guess that’s true. There’s been a whole lot of good that’s come out of it, and I’ve done a whole lot of things that wouldn’t have been possible without the exposure. As I said a moment ago, I don’t know what I would do differently than I did. CC: Thanks for taking the past ninety minutes to share your story. AA: You’re welcome. I’ve enjoyed it.